Below is a list of events. 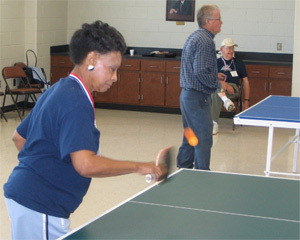 For all events, you must qualify at District Games to compete at the State Games. The 2017 State Games will be held in Trussville, AL on October 2 - 5, 2017. All events are divided into 9 age groups. All events have a men's division and a women's division and except for Domino Doubles and Rook. Your age is determined by the age you will be on December 31st of the year you play. Age groups include 50-54, 55-59, 60-64, 65-69, 70-74, 75-79, 80-84, 85-89, and 90+. In the partner events (Domino Doubles, Rook, Pickleball, and Golf 2-man Scramble) the age of the younger player is the age group you will play in.